I've known about this site for a couple years and wanted to check it out. But it's on the other end of Death Valley, I usually just drive past it. I thought I was going to be able to visit this crash site and then go check out some petroglyphs close by. The road going in was less than 5 miles, but it was a little rougher than I thought it would be. My Jeep would have beat the heck out of me, but my old Ford just floated along like a Cadillac. I got back on the highway at 1430. I pointed the truck towards the house with plans to go see the petroglyphs at a latter date. I was a week short of the anniversary date of this crash, but I have plans for next weekend. I had a rough start this morning, but she buffed out. Enroute from Nervino, CA to Lake Havasu City, AZ w/enroute stop at Furnace Creek, CA. The aircraft departed the Nervino Airport at 1030 for its cross country flight. The purpose for the flight was to drop off Christmas trees & visit with relatives. The pilot did not file a flight plan, but family members stated that the pilot had planned to land at Furnace Creek Airport at Death Valley to drop off a Christmas tree before flying on to Lake Havasu to spend Christmas with his parents. Attendants at the Furnace Creek Inn stated no aircraft landed that day due to low ceilings, rain & snow showers that day. The pilot’s parents reported him missing on Christmas Day when he did not arrive. The forecast was IFR conditions with low ceilings & near zero visibility in rain & snow. The FAA issued an ALNOT on 25 Dec. Authorities were alerted when the pilot did not show up in Lake Havasu. The search was conducted by CAP eventually involved over 60 aircraft operating from the Carson City Airport & was centered 100 NW of Las Vegas between Beatty & Linda Junction, NV. His family & friends participated in the search as observers. They reported the pilot usually flew to visit his parents via Carson City & Beatty. The search lasted 8 days without result & was suspended 4 Jan.
During the course of the search, the CAP obtained radar data from various military & FAA radar facilities. There was no positive radar identification or voice communication with the missing plane during the flight. The radar data was reviewed for VFR 1200 code aircraft based on a probable route of flight and approximate times. Analysis of the FAA & military radar tracked an aircraft as it approached the Betty VOR from the NW. It had been cruising at various altitudes from a high of 15,600 ft to 10,400 ft MSL. When it arrived in the vicinity of the Betty VOR, the aircraft then went into a circling descent & was lost at 8400 ft MSL. The Beatty Airport elevation is 3,170 feet MSL. Family, friends & volunteer pilots from Las Vegas & Southern CA continued a private search for several weeks after the formal search was suspended. Based on the radar forensics, they centered their efforts in the area around Beatty, NV. They conducted a variety of community fund raisers to fund search efforts by volunteer & CAP pilots flying on their own time. The NV state government offered to conduct aerial photo runs of areas identified by the volunteers. The wreckage was finally found by microwave technicians just off a dirt paved road to a repeater site at the 4000 ft level in the remote Greenwater Mountain Range of Death Valley, 16 SE of Furnace Creek, CA. It appeared the aircraft collided with the crest of a ridge line in a near level cruise flight attitude. An Inyo County ground team found the skeletal remains of the pilot in the wreckage. The debris field was 355 ft long. They also found the remnants of 3 Christmas trees. The NTSB determined the probable cause of this accident was the non-instrument rated pilot's intentional VFR flight into IMC. Pilot La Vern Kriene DeBerg, 57 with 700 flight hrs, whose spouse died in 1979, was not a wealthy man, but was well known in the community as a generous man. He worked as manager of a local quarry, was the chief of his local volunteer fire department & member of his hometown SAR team. 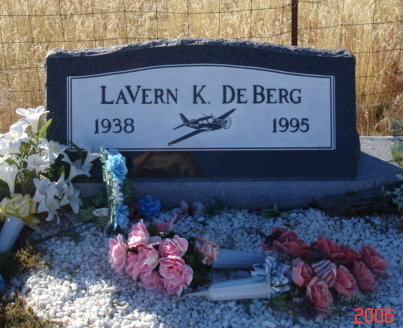 Registered to La Vern K. DeBerg of Chilcoot, CA. Here is the photo of Mr. LaVerne's headstone. Great info!!! I did a few searches but couldn't find this many details. I appreciate you sharing this. Lots to see there. Will have to go check it out some time.